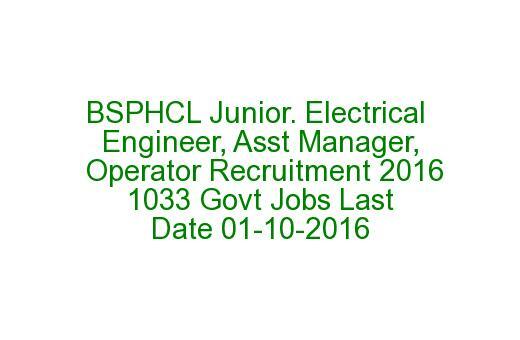 BSPHCL Engineer, IT Manager Recruitment 2016: BSPHCL (Bihar State Power Holding Company Limited), Patna invites application forms through online mode for itself and its NBPDCL, SBPDCL, BSPTCL, BSPGCL from candidates for the posts of Junior Electrical Engineer (General), Jr. Engineer (Mechanical), Junior Engineer (Electronics), Assistant IT Manager, Assistant Operator and IT Manager (Internal) for its offices. Candidates should send application forms through online mode only. Opening date for submission of online application forms is 15th September, 2016. Closing date for submission of online application forms is 01st October, 2016. Closing date to submit application fee is 01st October, 2016. All details of BSPHCL Recruitment Notification 2016 is mentioned below. Total Available posts are 1033. 1. For Assistant Operator posts, educational qualification is matriculation plus ITI in the discipline of Electrician trade. 2. For IT Manager, Assistant IT Manager posts, educational qualification is full time B.E./B.Tech. or MCA in the discipline of computer science/IT from a recognized institute. 3. For Jr. Electrical Engineer, Jr. Engineer posts educational qualification is diploma (three years) in the discipline of either mechanical or electrical or electronics. Age Limit : Candidate's minimum age limit is 21 years and maximum age limit is 50 years. Date to reckon this age limit is closing date of application. Department of BSPHCL (Bihar State Power Holding Company Limited) will conduct a written exam or interview for Jr. Electrical Engineer (For General), Jr. Engineer (Mechanical), Jr. Engineer (Electronics), Asst. IT Manager, Asst. Operator and IT Manager (Internal) positions. Bihar State Power Holding Company Limited selection committee will call candidates for written exam on 23rd October, 2016. Application Fee : To apply for above positions candidates must pay the application fee of Rs.1000/- for general category candidates; Rs.250/- for candidates belongs to Scheduled Caste (SC) or Scheduled Tribe (ST) category candidates through online mode. How to Apply : Candidates must log on to Bihar State Power Holding Company Limited's official website of http://www.bsphcl.bih.nic.in/ to apply online for Junior Electrical Engineer, Junior Engineer etc positions. 1. Opening date for submission of online application forms is 15th September, 2016. 2. Closing date for submission of online application forms is 01st October, 2016. 3. Closing date to submit application fee is 01st October, 2016. 4. Department of Bihar State Power Holding Company Limited will be held written exam on 23rd October, 2016.